Tax Auditor with a personality… that’s what comes to mind when driving the Nissan Altima with a 3.5L V6. When it comes to your typical family hauler, the Altima is just that – it’s your average car for the average person with an average job and average life. Last year, we had the opportunity to drive the Altima 2.5L and concluded that it was an ideal sedan for just about anyone – it was comfortable, economical, and in some ways, good to drive. So what happens when you throw in two extra cylinders into the mix? A lot of good stuff, that’s what! Competition is now starting to get pretty tight amongst the midsize sedan segment. After the release of the new Honda Accord, Hyundai Sonata, Subaru Legacy, and upcoming mildly updated Toyota Camry; the Altima needs to put up a good fight to keep buyers interested. Good thing it does. The Altima already strikes us as a handsome looking sedan. It has all the right curves in all the right places. Adding the SL badging increases its overall appeal with Bi-Xenon Headlamps, fog lamps, LED side mirror indicators and LED taillights. The 18” alloy wheels fills the wheel wells nicely adding an eye-catching stance while the optional $405 Rear Trunklid Spoiler makes for quite the sporty charm. And against our sampled Storm Blue coat, the Altima had just the right amount of chrome outlining its details. When you hear things like NASA inspired Zero-Gravity seats, you’re really not sure what to expect. Designed to decrease fatigue and muscle soreness while driving, what you can expect is a very comfortable interior. 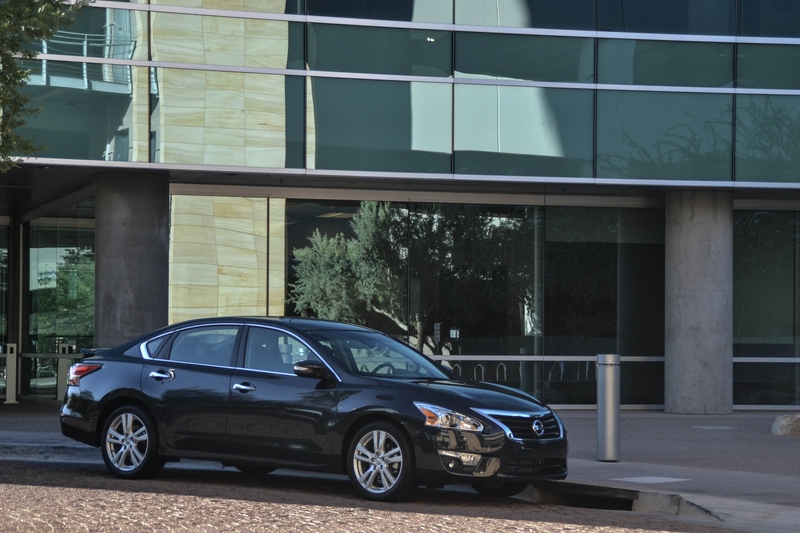 Our tested Altima arrived in a fashionable charcoal leather interior and room for 5 full-size adults. The interior is well laid out in a simplistic format using an attractive use of silver, piano black and faux carbon fiber trim. With the SL trim, the interior is boosted significantly. Cold winter mornings will be easily forgotten with a heated leather steering wheel and heated front seats. Front passengers can relax to their own temperature with the dual-zone climate control. And with the Bose premium audio, your traffic lip singing will increase by 50%. On the other note, our sampled Altima came with the $1,090 Technology Package that includes a 7” Navigation, Blind Spot Warning, Lane Departure Warning and Moving Object Detection. Reality check, save the $1,090 and add it to your Starbucks fund. While the Lane Departure and Blind Spot Warning are great devices to have, the Navigation here is simply not worth it. Opting for the Nav adds a cheap aftermarket feel and the back-up camera is not up to our industry standard with grainy pixelated imagery – plus the voice activation woman isn’t very pleasant to hear. When it comes down to the beating heart of the machine, the 3.5L V6 seems to be powered by Red Bull and Skittles. The 3.5L pumps out 270 horsepower and 251lb-ft of torque through a Continuous Variable Timing transmission, CVT for short. CVT’s aren’t known to be the greatest transmission to work with; however, Nissan has mastered the art of this transmission providing maximum power output while maintaining an economical balance in the fuel efficiency. In other words, the Altima V6 will go from zero to 60 in just over 6 seconds and will average 22 mpg combined. If you really want to feel like you’re driving a sports sedan, the console mounted paddle shifters are sure to do the trick by adding 7-simulated gears for a much more enthusiastic driving experience. Do remember, even though the Altima behaves and sounds like a sport sedan, it’s by far not one. It rolls around in the corners, partly because the suspension is soft and smooth over rough surfaces. From behind the wheel, the handling feels direct and precise for a family sedan. At highway speeds, the interior cabin is quiet. And if you can attempt at being economical, the Altima can average 22 city and 31 highway; fortunately, for as much as our right foot enjoyed the sound of the V6 from the dual exhaust, we managed to average 24 mpg combined. After our positive experience in the 2.5L S, it was going to be difficult for us to dislike the 3.5 SL. The Altima checks off all the right boxes when it comes to the family sedan check list. It offers a handsome hardy exterior with a comfortable clean designed interior that just so happens to be fun to drive – that’s an added perk.